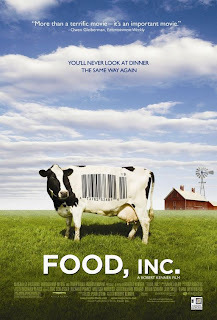 The Billionty-Oneth Geek: Food, INC.!!! When I first read Eric Schlosser's Fast Food Nation, the stories he told of the fast food industry made me so disgusted that it threw me off of fast food for a good 3 or 4 months. So it was with some trepidation when I watched in Food, Inc. knowing that Schlosser had produced it... because... well I just couldn't go off of all food for 3 to 4 months. Food Inc. manages to cover a wide range of topics related to the food industry in an attempt to unravel the insidious and corrupt aspects of the business. We're shown how more and more of all the food products we see in the supermarkets are controlled by fewer and fewer companies. Often on food labelling, we'll see pictures of farms or farmers, yet the food in reality is produced at factories, not farms at all. The great irony. Perhaps one of the most sickening sights we see is at a chicken house operated under the Perdue company. We see how chickens are mass produced and how many of them often die because they can't keep up with their own accelerated growth. One of the most heartbreaking stories is in the middle of the movie, where we learn of how a 2 year old boy died of E. Coli contracted from a hamburger that he ate. He died within 12 days of contracting the disease. We see how both the Republican and Democratic representatives push for a bill that requires the meat industry to do more stringent health and safety tests, but the stumbling block is one of the court judges... who was at one time a lobbyist for the beef industry. Like other movies of this nature, the end of the movie is like a call to arms, empowering the viewers to do their part in supporting the clean food production cause. I really recommend this movie to everyone. It's a subject matter that virtually everyone can relate to, given that we all need to eat and we all want to be safe doing so. So check it out if you get the chance! Later geeks! I thought this documentary was so so interesting... it hasn't changed my eating habits that much as I have already cut red meat and meat down in my diet, but I do still have it. Sometimes I feel like these issues are too big to change, but that's a bad attitude. Very good documentary, if you liked this one you should check out "The World According to Monsanto" which expands further on that companies evil practices. @Ally: I know exactly what you mean. And even some of the things they suggest, like only buying Organic, that can end up pretty expensive, and if you're on a tight budget (like the Mexican family) then is it really possible? @Mike: Thanks for the recommendation! I'll definitely check it out. This is the 2nd movie I've heard that slammed Monsanto, I wouldn't mind seeing a third! I will definitely watch this. You're right, this is something I'd love.